Take on the role of the famous spook-hunting quartet as you manoeuvre around the streets of New York by foot or by Ecto-1 plugging up gates to the spirit world and ridding the city of awful spectres! 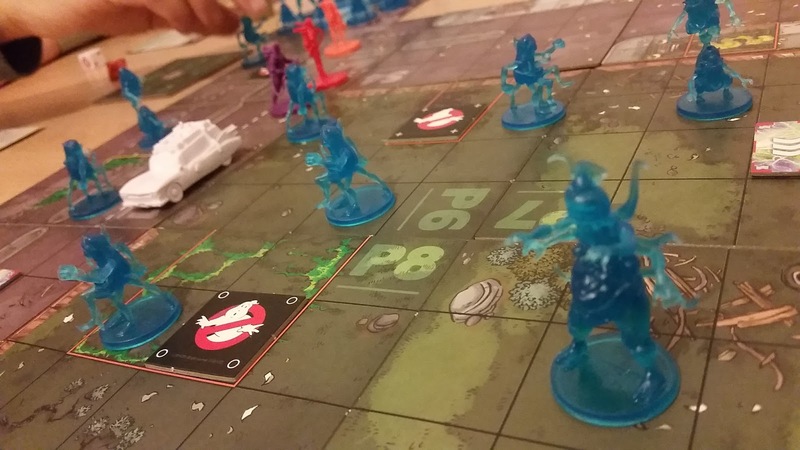 Ghostbusters is a tabletop game that consists of three scenarios. Each scenario has a number of missions (each mission is a whole game in of itself) to play that end with a battle with an iconic boss ghost. Since I had the game on loan I was only able to play three of the four missions for the first scenario, falling short of going up against Slimer for the finale. I did, however, get a feel for the game and its mechanics. 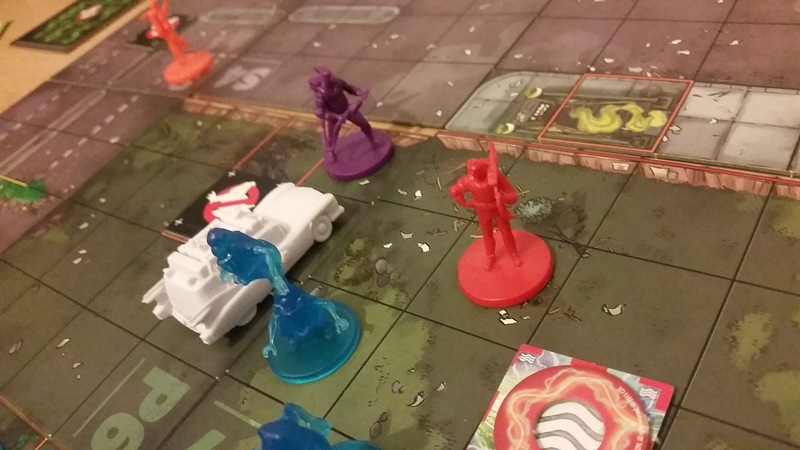 There are four players and each of you takes control of one of the classic Ghostbusters. The board is assembled by tiles according to a pre-ordained mission guide and a number of gates that spew forth ghosts are placed. Blocking your way are the ghosts that need to be blasted with proton streams and dumped back into the spirit world. The spirit world is a collective pool of ghost figures that sits to the side of the main playing area. If at any point in the game a ghost is required to appear in a gate and there are none left in the spirt world the game is over. This presents a ticking clock of sorts which is made even tougher by the addition of slime that slows your Ghostbuster down and prevents them from completing their tasks. Ghostbusters is co-operative game and requires careful strategising to complete the tasks. Each character has special abilities that level up based on XP given. The basic gameplay comes down to managing which character is taking on which task. Who, for example, is going to be clearing slime off people? Who is going to be racing ahead in the Ecto-1 while others go it on foot? Who is going to manage ghosts while another closes gates? In addition parameters (such as the way gates behave) change each mission meaning the same strategies won't always work. This is a game that doesn't just encourage teamwork but utterly relies on it. There are lots of figures to play with here. The ghosts are primarily made from a translucent coloured plastic (kinda like the ghosts you used to get with the Real Ghostbusters action figures) and are nicely designed spooks. You also get the four GBs themselves, an Ecto-1 model, Slimer and a whacking great Stay Puft. The quality of plastic isn't quite up to the same standard as other games of this type but the sculpts are good. The real quality is in the details. The 'six' side on one set of dice being replaced with the Ghostbuster's symbol is oddly satisfying, while the symbols used to differentiate gates are the ones from Venkman's psychic experiment at the start of the movie. You only need to look at the company's Kickstarter for additional expansions to see they have gone to great lengths to not only come up with interesting new beasties but pretty much every iconic ghost from the movies (and cartoons) so far. The smartest thing about this game is the way the difficulty increases. The first mission was so easy we worried we were playing it wrong, but by the time we'd reached mission three we were finding it to be a nice stretch. It was then we realised the game had been teaching us how to play. All the specific rules regarding ghosts and gates are placed on handy and available reference cards and once you're up and running it is the changing parameters that cause the slime/ghost management to be a struggle. Since the mechanics for that element are really straight forward this is great game for those new to tabletop action. You can also play the game on your own by simply taking control of all four characters yourself. It is a versatile game accessible for all skill levels. Ghostbusters was a fun and accessible game and one that allowed us to spend a good couple of hours playing without getting bored. The nicely judged difficulty levels, the simplicity of play and the attention to detail makes this a great addition to a collection and a good way of involving those not normally inclined to play these kind of games to get involved.